Traverse the binary search tree using depth first search (DFS) recursive algorithm . Left child node is less than its parent node. Right child node is greater than its parent node. The properties should hold good for all subtrees in a BST. We will demonstrate couples of examples to find min and max node in a BST. We have discussed about find min & max element in a binary tree. We will use the properties of BST to find minimum & maximum value. We are not required to traverse the whole binary search tree. What is minimum element in BST ? Leftmost child in a BST, is the minimum element. Traverse left nodes of binary search tree to find minimum element. No need to traverse the right nodes of BST. What is maximum element in BST? The right most child of BST, is the maximum element. 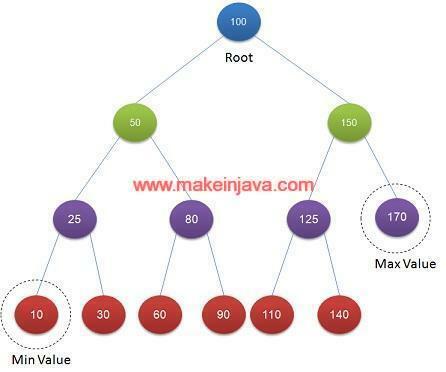 Traverse right nodes of binary search tree to find maximum element. No need to traverse the left nodes of binary search tree. Example 1: find min & max value in a BST (Fig 1). Left most child i.e. Node B (50) is minimum element in a BST. Right most child i.e. Node C (150) is maximum element in a BST. Example 2: find min & max value in a BST (Fig 2). Maximum value of BST is 170. We found the minimum value in binary search tree. Program to find maximum value in BST. MinAndMaxInBST class is responsible for finding minimum and maximum element in BST. Node class is representing the nodes of a BST. 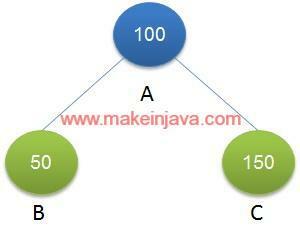 We are creating a binary tree in a main method. We are calling method of MinAndMaxInBST class, to find minimum/maximum element in a BST.